On our second night in Amsterdam, we wanted to have a little fun. We tried to rally a few of the other hostel guests to come into the city with us but only managed to convince our one new buddy, Corbin. We planned to go to a bar or club in the city and pass through the Red Light District on the way just to see it, but ended up spending the whole evening there! Corbin had walked through the district several times before, so he acted as our personal tour guide, pointing out all of his favorite…uh…stops. Honestly, the Red Light District was a little overwhelming for me. I’m slightly prudish, so seeing all of the barley clothed, fake-boobed, make-up caked-on women standing in windows twirling their hair and blowing kisses to summon impressionable, horny tourists into their lairs, was a little much for me. But Sarah and Corbin had fun with it! After walking around for at least an hour, we decided to forgo the bars and catch the last train back to the hostel. Sarah and I were both tired and I had definitely seen enough for the night. With minutes to spare before the last train departed from Amsterdam Central, we ran (like, actually sprinted) to the train station and bought our tickets just to find that the trains were halted for the night for track maintenance. We then had to find the bus that was running in place of the train, which was two blocks from the train station. The bus ride to the metro stop near our hostel took about 30 minutes. The hostel was an additional six-ish minutes via highway from the metro, and the hostel shuttle had stopped running by then, so we called a cab. Oh mah gah ya’ll. The cab driver told us the cost was 40 euros to get back to the hostel. SIX MINUTES. We negotiated down to 30 but it was still the most ridiculous cab fare I’ve paid. We got back to the hostel and finally clambered into bed, still huffing and puffing. 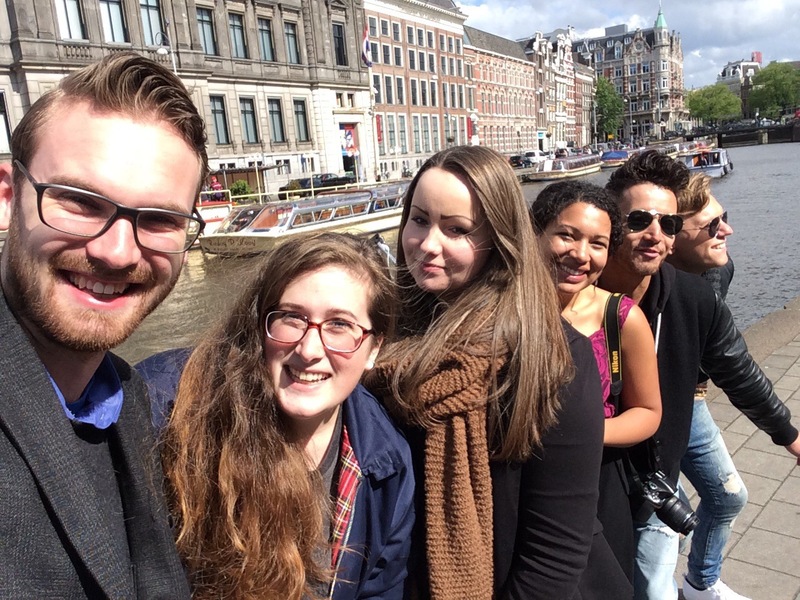 On our second and final full day in Amsterdam, we met with some of Sarah’s friends from outside the city. She had been to a convention in Amsterdam two weeks previously and she met some young cool cats from all around the Netherlands. She kept in touch with them and coordinated a meetup in Amsterdam when we were there. Sarah and I got to the meeting place a little early, so we stopped in a café (which we learned to call a café, not a coffeeshop. Ha.) and got some lattes. Then we perused the neighboring shops to pass more time, and finally made our way to Central Station to meet her friends. We enjoyed a leisurely day with them walking around the city. One of her friends, Jordi, was a Starbucks barista and knew all the Starbucks locations in town. He gave us a tour (which included free coffee, holla) of a few of his favorite locations. Caffeinated, we then stopped for lunch at an outdoor Irish pub on the canal. We later met up with a few more of Sarah’s friends who had been running late and the big group of us continued our tour of the city. I had been itching to go to a market all day, so Jordi showed us to the famed flower market and then the flea market. I bought some gouda from a sketchy-but-probably-fine cheese stand, and finally got my hands on a Dutch waffle! The one I got had strawberries and milk chocolate on it… deeeeelish. At some point in the day, I also bought a muffin from a coffeeshop but felt no effect. That was my first and last attempt at indulging in the local delicacies. Sarah’s friends were delightful. They were so funny and had such a similar sense of humor to ours. We had a blast walking around singing, laughing, and making jokes about our different cultures and languages. Apparently, the American pronunciation of “waffle” means “mouth” in Dutch, so everyone had a field day when I offered them a bite of my chocolately waffle. High-larious. We finally made our way back to Central Station with her friends. We said goodbye, but not before snapping a selfie with my totally-awesome-and-not-cheesy-at-all selfie stick. We went to bed early that night, tired from our long day, and ready to take on Norway the next morning. My goodness! Amsterdam is fun on steroids. 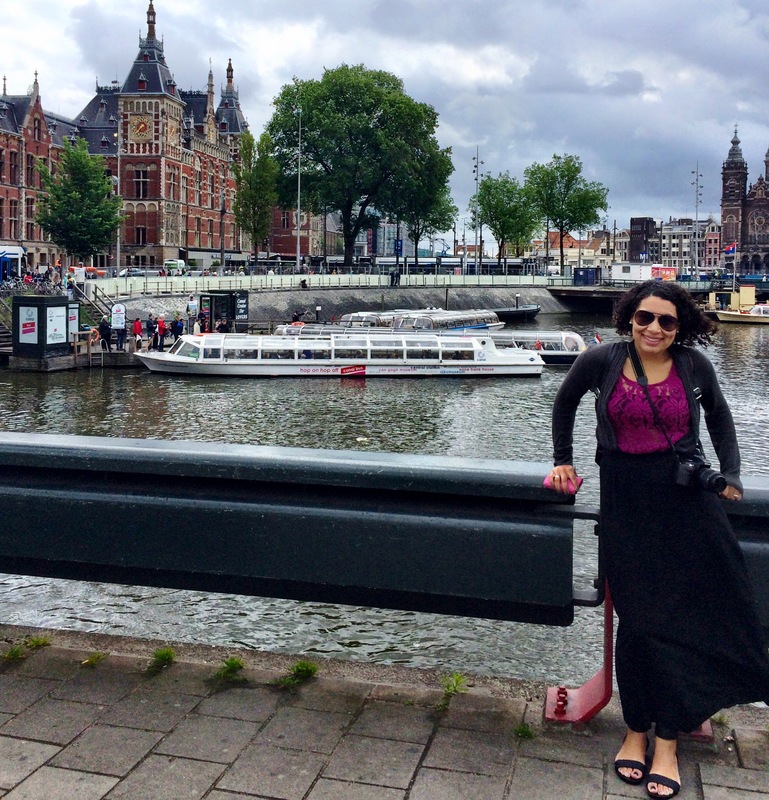 Amsterdam, the capital of the Netherlands somehow manages to have it all. It has the buzz of a metropolis, with few big-city drawbacks. It’s small enough to walk or cycle almost anywhere you want, yet is rarely dull. Dinky gabled buildings, pretty bridges and quiet canals give it village-like charm, yet you’ll also find top-ranking art museums and one of the best orchestras in the world. Most of all, Amsterdam combines its glittering past with a wry, rough, rebellious contemporary edginess.